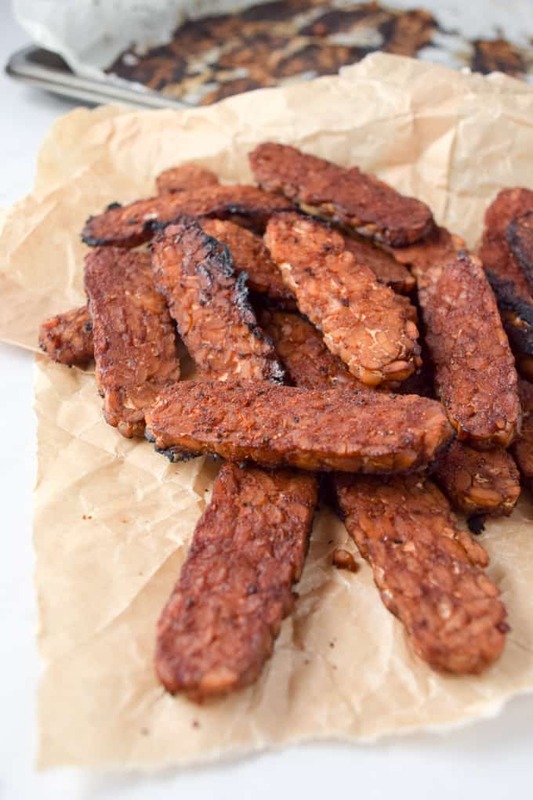 Tempeh: it’s kind of like the awkward second cousin of tofu. 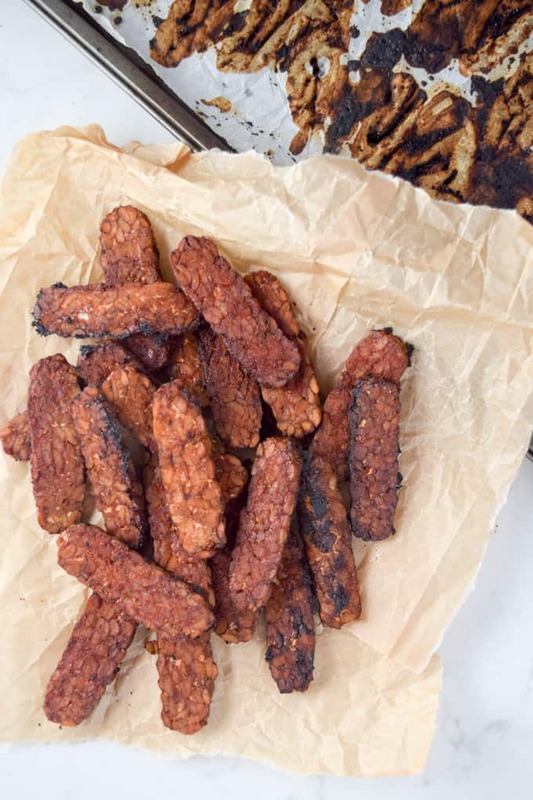 What exactly is tempeh? It’s fermented whole soybeans, packed with protein and it’s been around a long time. I know it doesn’t sound so exciting right now, but we ’bout to take it up a notch and make some Smoky Maple Tempeh Bacon. Before you even ask…NO, it’s not just like eating bacon! But, is it smoky, savory, sweet and have an aroma that will make your mouth water? Oh, yes! And, as an added bonus, this bacon won’t clog your arteries and eventually kill you. 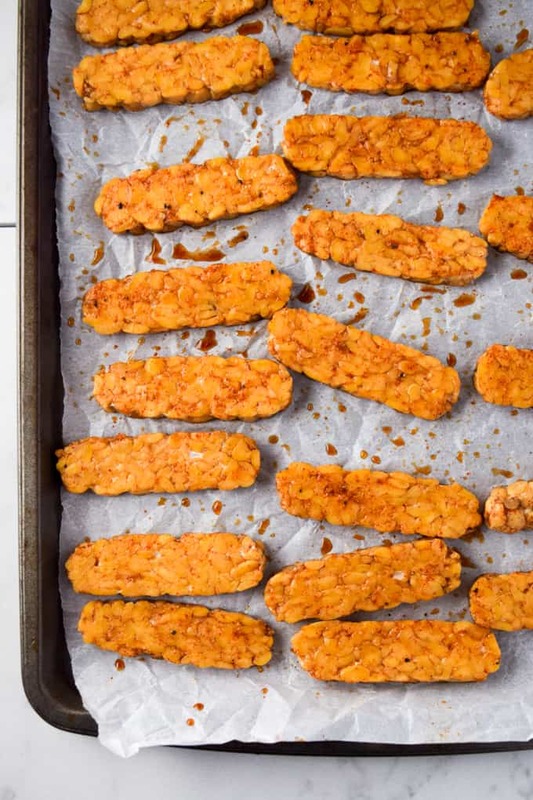 You might be asking yourself, “What the hell am I going to do with tempeh bacon?” Well, you could eat it directly off the pan before your kids swoop in like vultures and devour it. It’s absolutely awesome mixed into (or placed right beside) my Damn Good Tofu Scramble, nestled up nice and close to some delicious pancakes, or piled high on a sandwich (be on the lookout for this). But, why stop there? It’s also great on top of my Chipotle Bowl and a freaking mind blower in my Game Day Cheese Dip. Be sure and let me know if you try this recipe! Leave a comment, take a picture, post it on Instagram and tag the photo #shaneandsimple so I can see your dish. If you want to be kept up to speed on all that’s going down with Shane & Simple and my latest recipes SUBSCRIBE HERE! 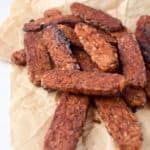 Smoky maple tempeh bacon is absolutely delicious and super easy to prepare. Pile it high in sandwiches, on top of salads, or anywhere you’d normally put bacon. Add all marinade ingredients into a small bowl and mix well to combine. Then, pour into a container large enough that marinade and tempeh will just fit. Not too large, not too small. 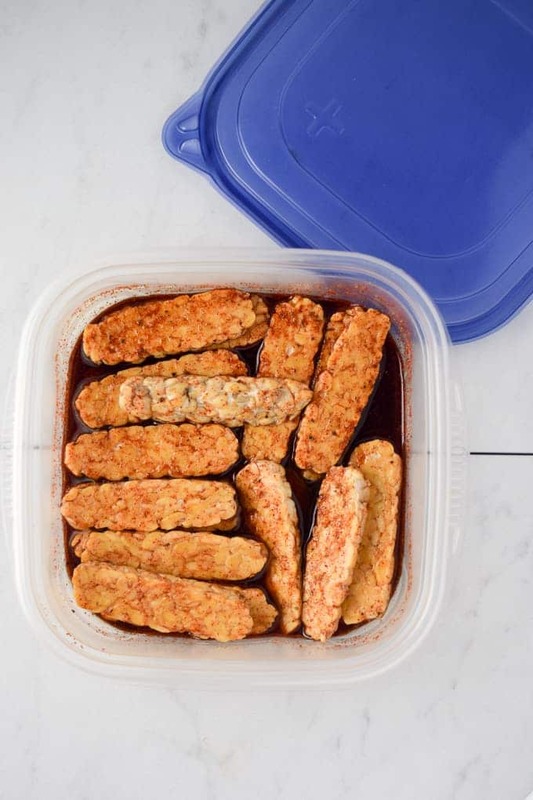 Carefully slice the tempeh into thin strips and place in the marinade, and make sure each piece is coated. Marinate for at least 20 minutes. If you can wait, let marinate in the fridge overnight. Layout tempeh on baking sheet and bake for 15 minutes. Remove from oven, flip over, evenly pour the remaining marinade on the tempeh. Place tempeh back in oven and cook for another 15 minutes or until most of the marinade has evaporated. Cooking time will depend on oven. Tempeh can have a somewhat “bitter” flavor to it, which I like. 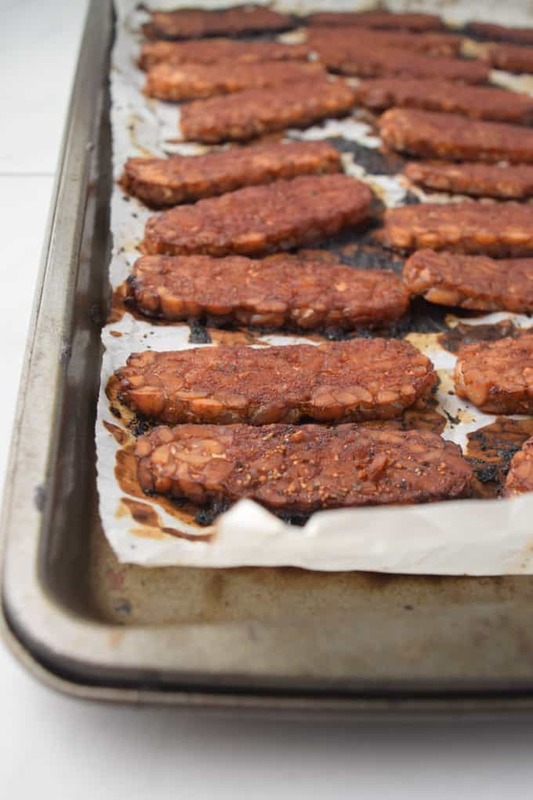 But, if you want a milder tempeh you can simply boil or steam it for about 10-15 minutes. Mellows it out. Thank you for this! I’ve made this recipe twice this month since I found your blog. It adds the best flavor and dimension to my lunch veggie bowls. Excited to try more of your recipes! Just made my 1st batch! Love the seasonings. I forgot to cut up the tempeh before marinating it so some pieces were kinda white. I let it marinade for almost 2 days only because I forgot about it. I broiled it for a few minutes to get it a little more crispy before eating. Lastly, next time I will make extra marinade to keep it moist before broiling. Overall, I’d say it’s a keeper! Thanks. Thanks, Gloria! Glad you enjoyed it and love the idea of broiling it. Blessings! Sorry, Debbie. Tempeh isn’t for everyone, but I do appreciate you giving it a go. Blessings. I just finished eating a grilled cheese sandwich with strips of this homemade smokey maple bacon and I am in love!!! It was easy and it’s absolutely delicious! Thank you soooo much! Kristina, thank you so much and so glad you liked it! Peace and feast.